Now researchers at Northumbria University, in Newcastle upon Tyne, have come up with a solution which could lead to a change in how homes are designed in the future – making mould a thing of the past. 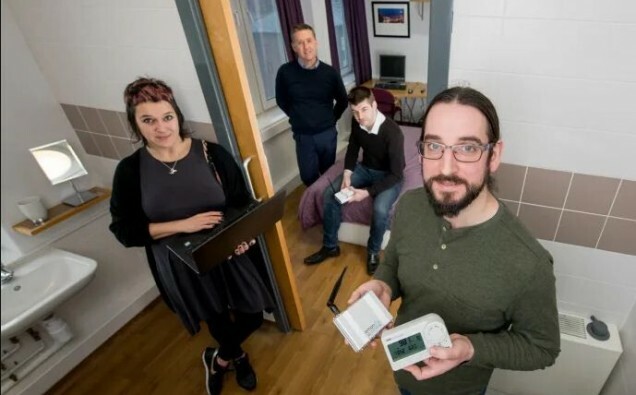 Over the last year, Northumbria academics, along with partners from BIM Academy and the National Energy Foundation, have been working with local housing organisation Your Homes Newcastle to find out more about how its customers live in their homes. This can be used to understand how customers use buildings, provide alerts and advice which will help them live more comfortably, and influence the design of buildings to better reflect customers’ requirements. The findings of the Smart Connected Buildings project will be presented next month at the annual BIM Show Live conference by Dr Kay Rogage, Research Fellow in Digital Living at Northumbria and an active member of the University’s BIM Academy Research Team. She explains: “One of the benefits of this system is that it can be customised, so for example an alert could be set up so that when the humidity in an individual flat or room goes above a certain level the building owner or occupant would be notified. “The data would also be displayed on an online dashboard, showing humidity levels over a few days or weeks, so patterns and potential issues could be identified. The project has been funded by Innovate UK, with the aim of integrating building design information, sensor data and feedback from building users to produce meaningful alerts and advice to builders and owners. The team involved now hope to source additional funding to develop the prototype into a commercial grade software which could be used by housing associations, property owners, developers and others working within the housing and building sector. The prototype would include additional features, such as the ability to extract data from Standard Assessment Procedure (SAP) reports – used by the Government to assess and compare the energy and environmental performance of homes. The reports contain useful information such as the estimated energy consumption of a building and these values could be included into the current alert system to automatically trigger an alert if the estimates are exceeded. BIM Academy Director Graham Kelly said: “Building Information Modelling has been successfully used in the design and construction of buildings for some time, but buildings’ owners and occupants still don’t have any way of measuring how their building is performing once it is complete. Ian Gallagher, Assistant Director Operational Property Services at Your Homes Newcastle, added: “As the managing agent for Newcastle City Council’s housing stock, we want to provide homes where people are warm and comfortable, are able to control the environment they live in, and can rely on us to proactively avoid problems which can cause them upset and concern, such as mould, damp and condensation. Dr Kay Rogage, who is based within Northumbria’s Department of Computer and Information Sciences, will be discussing the Smart Connected Buildings project at the BIM Show Live on Wednesday 27 February – for more information about the event, and for a full schedule of speakers, click here. For more information about the Smart Connected Buildings project, read the BIM Academy blog. In September last year the Smart Connected Buildings project won the best paper award for information communication and technology at the 2018 Sustainable Ecological Engineering Design for Society.